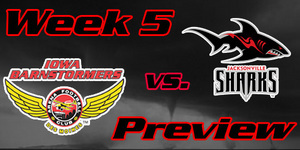 The Barnstormers struggled to produce a win against the Jacksonville Sharks as they fell 27-79 to the number one team in the American Conference, South Division. The Sharks came out strong as they put up 35 points in the first quarter to Iowa’s 7 points. The Barnstormers seemed to struggle both offensively and defensively as they were held to only one touchdown per quarter. The loss resulted in the Barnstormers falling to last place in the National Conference, Central Division. After a bye last week, the Iowa Barnstormers (2-7) will take on the Utah Blaze (5-4) this Friday at Wells Fargo Arena in Des Moines, Iowa. The game is important for both teams as they each try to re-establish themselves as playoff contenders. It will also be the ‘Stormers first since the resignation of Head Coach John Gregory. While Utah has seemed to be a back and forth team this season, Iowa will be fighting to break their losing streak for a shot at playoffs. The Utah Blaze is currently ranked first in the AFL for total offense with 82 touchdowns and an average of 330.4 yards per game. The Utah Blaze played on their home turf last week against the San Jose SaberCats. The competition was fairly even throughout the entirety of the game as both teams went into the locker room at halftime tied 35-35. The third quarter was controlled by the SaberCats, however, the Blaze was able to bounce back in the fourth, taking the game, 76-68. The performance of the Blaze earned themselves all seven of the postgame accolades, including the MVP of the Game and the Cutters Catch of the Game recognitions. The win moved Utah to second place in the National Conference, West Division. Iowa Barnstormers vs Utah Blaze will be featured as the NFL Network Game of the Week along with being broadcast LIVE on 1700 AM The Champ, on the Internet at www.theiowabarnstormers.com and at www.nifty-tv.com. -This will be the first meeting between the Iowa Barnstormers and the Utah Blaze in their franchises’ history. Brian Lee-Lauduski was able to divulge his abilities in the Barnstormers game against the Jacksonville Sharks two weeks back. With not much playing time under his belt this season, Lee-Lauduski posted season-high stats completing 13 passes for a total of 185 yards, including a 30-yard long pass to Larry Beavers. He rushed for a total of 4 yards and posted three of the four touchdowns for the Barnstormers.